Why didn’t the fish cross under the road? Think about how you arrived to work or school today, yesterday, or last week. Did you go by car, bike, or train? Did your journey include traveling over a river, wetland, stream, or estuary? 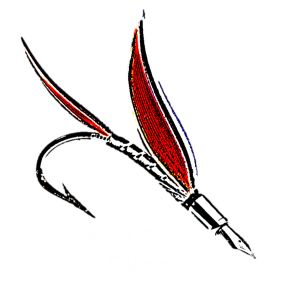 If you answered yes to either of these questions, it is very likely that you crossed over a possible barrier to fish and other aquatic organisms. Roads criss-crossing a tropical Australian landscape. What could this barrier be, you ask? Well, it’s none other than a road culvert. You know what I am talking about, right? Those metal pipes under roads, sometimes they extend out from underneath the road, and they can even be a little bit creepy (who knows what could be hiding in there!!). Yeah those, those are culverts. Road culvert on a small stream in rural Wisconsin, USA. Around the world culverts have been installed where roads cross over streams. 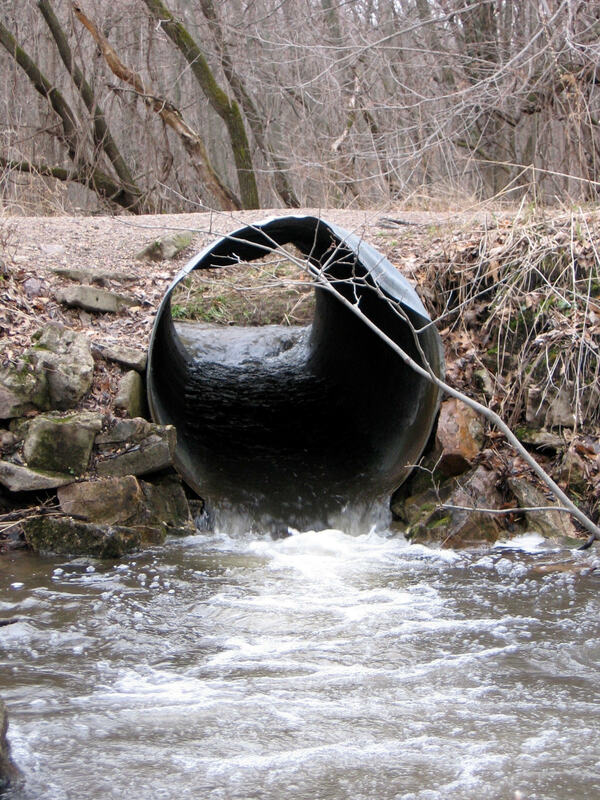 Most of the culverts that can cause problems for aquatic species like fish occur on streams or river reaches relatively small in size (think of streams less than 10 feet or a few meters in width). On bigger stream and river reaches, bridges, or box culverts (often made of cement or wood) are used to allow water to flow through freely and don’t cause as many problems for fishes. So what’s all the fuss about culverts anyway? Well, culverts can have several major impacts on fishes and their movements. First, culverts that are smaller than the width of the stream where they sit can actually act like giant fire hoses during times of high water flow, projecting high flowing water and making it very difficult for species to move upstream. Second, culverts in hilly or mountainous areas can form mini-waterfalls that also limit movement of fishes and other aquatic organisms. These mini waterfalls result from culverts that are not placed in alignment with the river bottom and are therefore ‘perched’ above the water. Not only do these perched culverts create mini waterfalls, they can often be elevated so far from the water’s surface that fish would need extreme leaping abilities (think salmon) to enter in the culvert. The firehose and waterfall effects are particularly bad because often high flows coincide with when fishes (and other aquatic species) need to move upstream for their breeding. Limiting species movement upstream for breeding can result in reduced numbers of individuals and in some extreme cases the loss of entire species. There are likely to be hundreds of thousands to even millions of road culverts that occur on small streams and rivers across the globe. In the Laurentian Great Lakes, we documented some 250,000 road – stream crossings that could support a culvert that acts as potential barriers to migratory fishes (read more about it, here). The accumulation of small, but abundant barriers, like culverts, is contributing to the decline of fish numbers and impacting fish communities across the globe (imagine towns disconnected by walls that don’t allow people to move in and out). 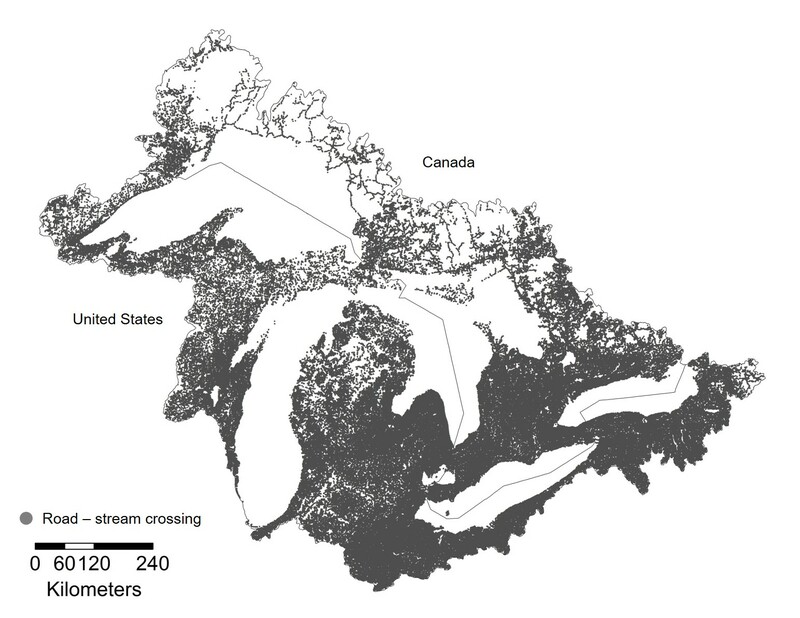 More than 260,000 road-stream crossings (the point at which a road crossings over a stream) occurring across the Laurentian Great Lakes Basin. Read more about the project to map these barriers, here. So, what can we do about this? 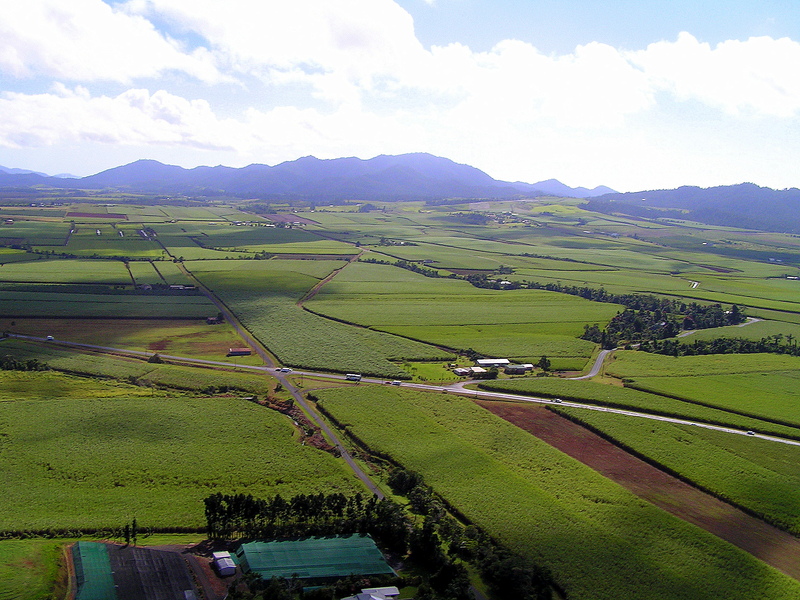 Well government agencies, citizen and community groups, even academic researchers across many different parts of the globe are working to identify solutions through coordinated efforts. There is even a World Fish Migration Day, devoted to raising awareness about the importance of open rivers! There are diverse and creative solutions underway! In New Zealand, groups are using ropes secured between perched culverts and streambeds, and in North America, troublesome culverts are increasingly being replaced with eco-culverts that allow organisms to move freely through culverts. It is a great time to be thinking about fish passage; there are a growing number of success stories, with fish passage being improved along entire river networks! With all of this talk about culverts, don’t be surprised if you start identifying road-stream crossings on your next drive into work or school! You never know, you might just pass over a remediated culvert with fishes swimming through merrily! In the North Atlantic (including CT, where I live), The North Atlantic Aquatic Connectivity Collaborative has been constructing a culvert database using standardized assessment protocols. I definitely have seen some weird stuff when out surveying culverts: a box culvert carpeted with swarms of crayfish living in silt, some that stretch beneath major highways, and a bridge that seemed to be carved into a mountain – which ended up being one of the coolest spots I saw this year. Now when I was out sampling streams this summer, it seemed like bridge/culvert pools were always home to many wild trout. Surprisingly, this was often on both sides of the barrier, even if the culvert seemed insurmountable due to height or low flows inside the structure (seemed to be very common). Would be interesting to compare. Thanks for sharing your story, Frank! I am aware of the efforts by NAACC – great stuff! I will try to keep a better eye on the advancements that the group is making. Looking forward to future publications! That’s a true story about fish.